Progress, Nephalem, and Health Orbs seen in a Greater Rift. Health Globes or Health Orbs are red, floating globes of life energy that "drop" from slain monsters or fall from Bosses at set intervals of their life (usually 25/50/75%). Health globes are "used" when a character passes through or near one, and instantly refill 15% of a character's maximum hit points. All characters in the party in the immediate area also enjoy the life gain. The amount of Life restored by Health Globes from Rare monsters has been reduced from 30% to 15%. The amount of Life restored by Health Globes from Champion and Minion monsters has been reduced from 20% to 15%. Players may also see also yellow Nephalem Orbs anywhere in the game, and purple Progress Orbs only in Greater Rifts. The chances for a health orb to drop vary by monster type. These odds may be increased by special bonuses on some skills and items. Normal monsters: chance to drop a health globe on death varies by monster type. Champion monsters: 60% chance to drop a health globe at 50% life and on death. Rare monsters: 100% chance to drop a health globe at 50% life and on death. 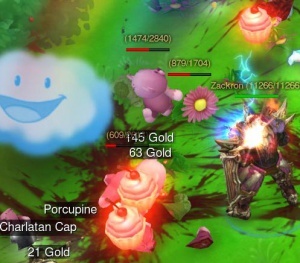 The minions that spawn with the yellow-named Elite usually drop a health globe as well. Larger bosses, such as Guardians and Act Bosses, generally drop a health orb at 25/50/75% hit points. Health globes only add hit points up to a character's maximum life and provide no benefit or bonus above that level. A health globe has no healing effect when used by a character with full health, though if a character has a proc triggere by the health orb that will still function even at full health. Since health orbs are shared throughout the party in close proximity, a full health character can heal a low health party member by hitting a health orb nearby. Each health orb is consumed completely when used, vanishing from the world. Health orbs cannot be moved; rather, they simply float where they spawned. If no player uses one, however, they will remain floating there for some time, and can be returned to for a later health boost. Players often save them by avoiding them and leaving them behind, if they need to return for healing or more often for a resource fill (such as Demon Hunters using the Blood Vengeance passive. Cupcake health orbs in Whimsyshire. 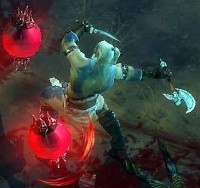 Health orbs are a major part of Diablo III's gameplay design. The D3 Team has worked to remove the easy ways of healing and escaping from trouble that were so common in Diablo II: no more can characters count life leech equipment, or belts full of potions that can be used instantly and repeatedly, or Town Portals for quick town returns. These changes allow the developers to make the game more consistently challenging unlike Diablo II, where the only way things were hard was if a monster could kill a character in an instant, and that wasn't hard, it was cheesy. We changed the health model, so that players don't rely on potions. Instead they can pick up health power-ups from enemies. It doesn't change the basic way the game plays, but it gives it a little bit more depth. You don't have one answer to healing in combat – "I'm in trouble, I hit a potion." Instead, "I'm in trouble, there's a health globe over there, and there's a 20-foot demon standing between me and it." That's a really interesting situation for the player, but it works with the same complexity of interface and gameplay that we had. ...We did put health potions back in, but they play a very different role. You can't spam them like you used to, you can only use them about once a map. The purpose of those is to take the edge off the loss of health. "I don't have health, or I've got half health, do I want to use a health potion, or do I want to risk it? Ooh, I've got 10% health, it's not even a decision." That's a really interesting decision, and it makes potion use a fun part of the game. During development there were hints of more powerful types of health orbs, but these did not make it into the final game. More powerful health globes, capable of completely restoring your health even at death's door, might exist somewhere in the world of Sanctuary. Of course, that's probably wishful thinking. Boss monsters drop health orbs at intervals, to give players a way to sustain the battle. This was part of the developers' plans from the earliest days. Jay Wilson commented on this in 2009,  "[bosses] would drop health globes at percentages of their health. Rares in particular are almost guaranteed to drop about every 25%." The Systems: Health page on the official Diablo III site used to include some hypothetical examples of how health globes might have to be utilized in a boss battle. When you do battle with stronger foes like "rare" and "champion" monsters, you're likely to see medium-sized health globes emerge as they reach certain health percentages or are stripped of their defenses before death. Medium globes restore a sizable percentage of your health, and you'll need the extra boost to survive when dealing with these formidable enemies. Major boss fights make unique use of health globes. Each boss battle includes a custom-designed means of utilizing these globes to regain health. For example, in one fight, you might have to split your attention between weakening a dangerous boss and slaying its irritating but ultimately less-dangerous minions in order to get enough health globes to stay standing. In another fight, the boss itself might drop health globes when it takes damage, or you might have to hunt for hidden caches of globes in the midst of battle. During testing of the PvP Arena at Blizzcon demos in 2010, health orbs appeared in pre-set points every 30 seconds after the start of a round. They never appeared when players died. Health orbs grabbed in the arena grant their full benefit (at that time, 40% of max hit points) to all nearby members of the team, as well healing pets. 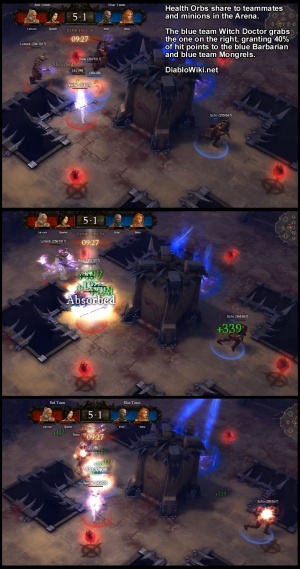 This dynamic can be seen in the three-shot series to the right, where the blue team Witch Doctor gets an orb that grants a health bonus to his Mongrels, as well as the blue team Barbarian. Characters and minions need to be nearby to share in this health bonus; a character off the visible screen will not partake of the healing bonus. Health Orbs were a strategic factor in the Arena matches; getting them was obviously a benefit, but it was also helpful to grab them even if you weren't low on health, simply to deny the heal to the enemy team. That the health orb spawn points were right in the middle of the arena (at least on the one map available at Blizzcon 2010) forced the action into the center of the level. Many rounds ended with the last survivor of one team dodging attacks around the perimeter of the level, and while this could extend a round for some time, it was very seldom a way to win, since the pursuers tended to be in the middle and would therefore score some health orbs, while the character running for it had no chance to heal up as they hid. Blizzard commented on this via @Diablo in April 2011. The first Health Globe was shown at WWI 2008 with the announcement of Diablo III and the Barbarian/Witch Doctor. It was originally just a floating red "blob", but has since received a graphics update (as of BlizzCon 2008) with a little golden crown on the top and bottom. Health Globes as well as Mana globes were present in the Blizzcon 2008 demo, where fans first got a chance to play the game. By BlizzCon 2009, the Mana Globes had been removed and the function of Health Globes had been modified a bit, with a few Wizard skills (such as Stability Control) and Witch Doctor skills (such as Spirit Vessel) modified to allow mana gains from the consumption of health globes. This changed further in early 2010, when the Wizard's new resource, Instability was revealed. This resource, later changed to Arcane Power, was not affected by health globes. The Witch Doctor, on the other hand, continued to gain mana from health globes. Mana Globes were removed in 2009, with some skills changed to give the Wizard and Witch Doctor mana from using health orbs. Currently, the Wizard, Demon Hunter and Witch Doctor can all receive resource from the globes (through the Power Hungry, Vengeance and Gruesome Feast passive skills, respectively). All classes can gain resource with each health globe when using the Reaper's Wraps bracers. The appearance of health globes has improved during development. They were initially just red orbs, like a huge drop of blood floating in the air. Over time this look was stylized, and health orbs now wear a golden frame, almost like a jewel setting or a crown on the top and bottom of the orb, a change that gives them a more oval shape. Two health orbs in early artwork. This page was last edited on 13 February 2015, at 07:54.